court reporting Garden Grove California | Todd Olivas & Associates v3.0 | Court Reporting Services in Orange County, Riverside, San Bernardino, San Diego, Los Angeles, Irvine, Santa Ana, San Jose, Sacramento, Fresno, San Francisco, Bakersfield. TO&A employs no court reporters, interpreters or videographers of our own. The providers we send are fully qualified and reliable independent contractors. Welcome to Garden Grove! We're proud to have access to one of the best deposition-taking environments anywhere in town. If you're looking for a deposition suite that facilitates a quality court reporting, interpreting and videography service -- look no further! The TO&A Crowne Plaza Conference Rooms are located within the beautiful Crowne Plaza Anaheim Resort, and offers our court reporting clients nine conference/deposition rooms. 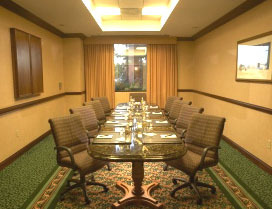 Our elegant Executive Boardroom, furnished in exotic marble, is also available. The fully-furnished rooms are equipped with wireless and highspeed internet, LCD projector, and complete audio-visual and videoconferencing is available. As a full-service hotel, you will find dining convenience on-site, with many other dining selections within walking distance. Just minutes away are some of Southern California’s premier recreational activities and shopping. Please do not send mail to this location. We do not receive mail here. * Unless specically stated, we are not physically at this location. We book these rooms on an as-needed basis on your behalf. This location may have a rental fee and some depositions may require an initial deposit. Please contact us for a quote. * TO&A employs no court reporters, interpreters or videographers of our own. The providers we send are fully qualified and reliable independent contractors. "Great customer service; great reporter; and would recommend to a friend." To schedule a Garden Grove Court Reporter, please schedule online or call (888) 566-0253. We'll provide you with a freelance court reporter, interpreter, and videographer in Garden Grove, California. The court reporters we send are state licensed (where applicable), and always prompt and courteous. Our goal is your complete satisfaction which is why we only work with the best court reporters available. Our interpreters are all certified, all languages -- and be sure to tell us which dialect you need if it's an exotic language. We know how it goes. Sometimes it's necessary to cancel your deposition. Cancel without obligation up to 48 business hours prior to the deposition upon WRITTEN NOTICE. However, due to financial obligations incurred by Todd Olivas & Associates, cancellations under 48 business hours will be billed at the prevailing cancellation rates. To request cancellation, please submit a Cancellation Request via fax, or e-mail. - Do not send mail to conference suites. Send it here instead. © Copyright 2019 Todd Olivas & Associates, Inc.
TO&A employs no court reporters, interpreters or videographers of our own. The providers we send are fully qualified and reliable independent contractors.